1. I don’t think there is anything I have been loving more this summer than the perfect pair of denim shorts and these festival high-rise from AEO are just that! Not to mention I am in love with the decorative blue eyelet lace pockets details! 3. Exfoliators are pretty much my favorite things on earth! I’m always looking for a new one to give my skin that little oomph! The girl at Sephora definitely ran with my obsession with Josie Maren products and convinced me to try out this interesting powder exfoliator that works wonders! 4. My second favorite thing on earth are masks and this one is an oldie but goodie! When it comes to cleaning out all the toxins from your skin, there really isn’t anything better! 5. Another fashion item I can’t get enough of are lace up sandals! I have been wearing these ones all over the place and I even went ahead and bought a black pair for work! 6. I decided to stray away from my usual St. Tropez and Loving Tan. Don’t ask me why, I just had a feeling that I needed to! I’m glad I did because I found this beauty that is super nourishing for my skin but also gives me a great glow without the damage! 7. 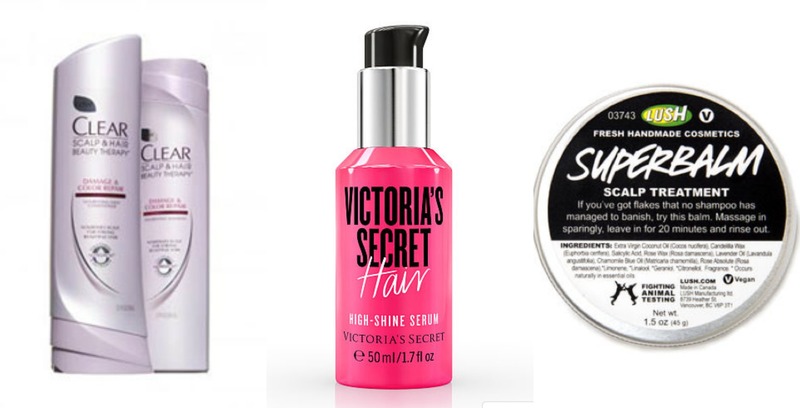 Surprise, surprise, a Victoria’s Secret item made the list! I was CRAZY excited in our associate meeting when the first told us about the brand new body care line and even more excited when I got my samples! This collection is amazing and I especially love the scrub and lotion! AND they are $8 right now! With my vacation coming up on Sunday (I’m so excited btw!!!) 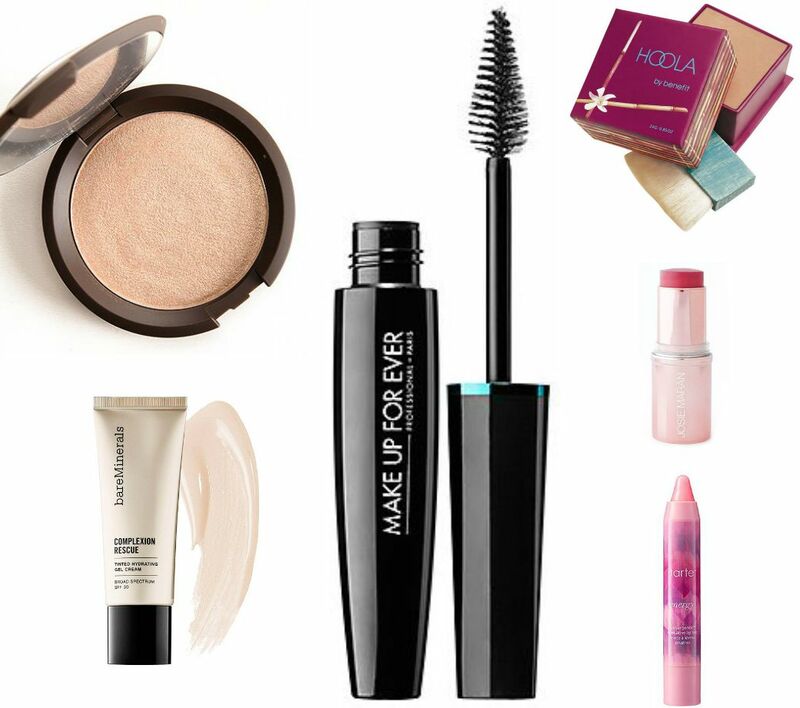 it got me thinking about what I wan’t to bring makeup wise for a beach trip. I don’t usually wear makeup to the beach, but we will be doing other things beside laying on the sand and lounging in the pool. For me I like to bring as little as possible especially for a laid back vacation such as this one. So I though it would be fun to share my go to items to give a pretty look without having to put on a full face! 1. I think the safest bet is to not wear a full coverage foundation. I personally am not a fan of foundation in general so this bareMineral Complexion Rescue is perfect for me! It’s extremely lightweight, but will cover any uneven spots I may have from being out in the sun. 2. Becca Highlighters are my absolute favorite! I couldn’t possibly leave this behind. It gives you the perfect dewy complexion that will “highlight” your just left the beach look! 3. The most important of them all is the waterproof mascara! Mascara is the one thing I rarely ever go a day without. This one from Make Up For Ever is perfect because not only is it waterproof, but it is also heat resistant which is a must! 4. Since I rarely let the harsh rays from the sun hit my face (I’m usually drenched in sunscreen or wearing a hat) I need a bronzer to give me some extra color so I don’t look too uneven. My hoola bronzer goes on so smooth and blends easily into your skin to give a natural look at the points the sun would usually hit your face. 5. I was never a fan of blush until I found this one by my favorite beauty guru, Josie Maran. This color stick is very creamy and just adds the perfect tint of color that makes you looks naturally flushed. 6. Now when vacationing at the beach, I prefer to stay away from brightly pigmented lips. I recently had an impulse buy at Sephora for the Tarte LipSurgence Skintuitive Lip Tint and I have to say that I’m in LOVE! It works with your natural pH to give you a unique pink every time. It’s almost like a mood ring in gloss form that also nourishes your lips! We’ve all been there, some more than others (a.k.a. me!) Whether it was a personal decision to stay up late on a night where you need to wake up super early the morning after, or if it is an odd schedule you are on. I personal suffer from a random work schedule that sometimes has me working until 5am and has be back at 9am… It’s the worst. So I have been trying out some products lately that have help hide all that tiredness from showing all over my face! I don’t know about y’all, but my body goes completely bonkers in the winter time. The harsh winds, cold temps, and heavy clothing just do a number on my skin, hair, and health. So I though I would share some of the items I consider necessities for this time of year! My lips are usually the first to go on the winter war path. In the past years, I’ve learned out to maintain this sensitive area before the damage is done. The first step is to use a lip scrub. This removes the dead flaky skin and create soft lips. I usually like to sleep with Neosporin on my lips to really make sure they stay healthy and healed. For the daily dose of soothing, I turn to my trusty Carmex to keep my lips safe from the cold air! Neosporin, VS Lip Scrub, and Carmex! Lush Superbalm, VS Hair Serum, and Clear Shampoo/Conditioner. Now I don’t suffer from acne or anything (I’m really lucking when it comes to that) but my face does tend to dry waaayyy out due to all the harsh winds this time of year. And unfortunately for me, I can’t use any heavy creams that could probably fix this problem in a heartbeat because they are the one thing that will actually make me break out. So I went on the hunt for some products that were strong enough for the Virginia winds but gentle enough for my skin! St. Ives is the perfect scrub with the teeny tine micro beads that aren’t too rough for my skin, but gets the job done! 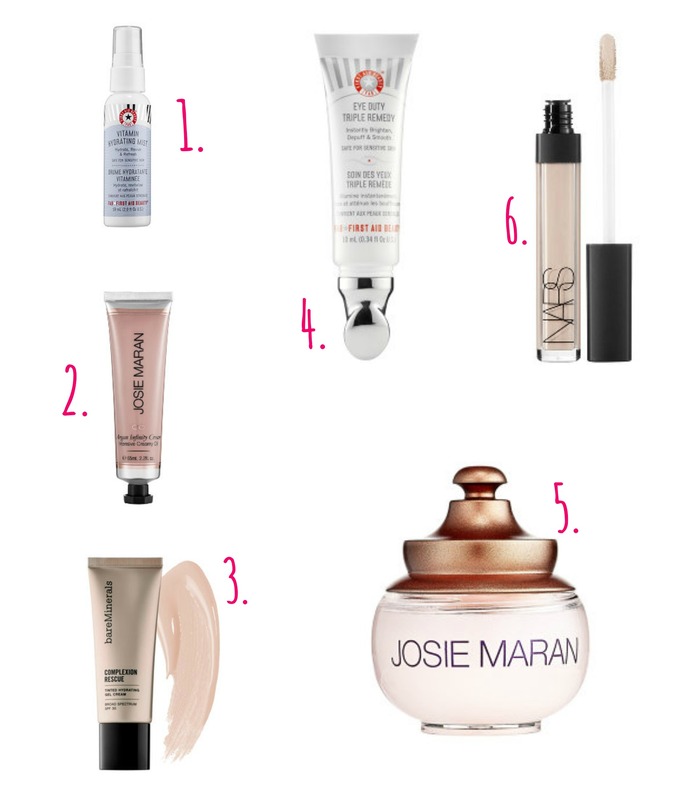 You all know how I feel about the Josie Maran + Mario Badescu products so it’s no surprise that they are on the list! Lastly, is body care. This requires prep before the moisturizer. Warms showers to fight the cold can dry out your skin, so what you use in the shower is critical! I love the venus razors with the extra Olay Strip to give that extra moisture base. 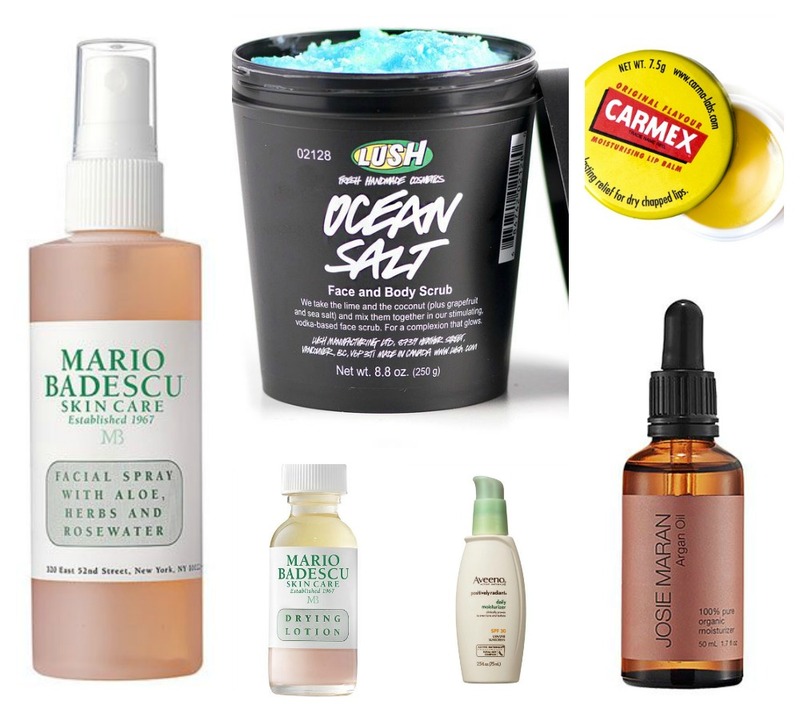 The Lush Ocean Salt helps to scrub away dirt and dead skin leaving skin soft. My favorite step is the Neosporin Daily Cream! I love Neosporin products because the are made for healing and I believe it just make my skin look it’s absolute best! While the winter time is so beautiful with the sparkling lights, holiday decor, and parties it is definitely not so pretty on your skin! When it comes to taking care of my own skin during this harsh time of the year, I’ve found some products that I truly can’t live without! These products give my skin the extra boost of moisture that it really needs without making it go completely crazy! My all time favorite brand is Mario Badescu! It is so gentle and refreshing while still removing all the dirt that has piled up on your skin throughout the day! My favorite items from their collection are the rose water spray (smells just like roses, so good!) and the drying lotion. The rose water can be applied anytime of day, especially if your feeling on the dry side. It really just refreshes your skin. The drying lotion really helps with any redness or breakouts that might occur with the climate change. Wear it overnight and all your problem areas will be erased, its amazing! My next favorite is the Josie Maran Argan Oil! This stuff is life changing and can be used in so many ways! You can put it in your hair for an overnight treatment, use on your face to heal any dry or cracked skin, or drop some in your bath for a full body treatment! I prefer to use this at night so that I don’t look greasy during the day! The Aveeno Positively Radiant Collection is perfect for the daytime! It keeps your face moisturized all day long without creating a shiny look or clogging your pours! I am a huge supporter of exfoliating all the time! I don’t feel like anything is getting clean unless I do it every night. And the Lush Sea Salt Scrub is the best! It’s all natural and gets all in there to make sure your skin is clean and fresh at all times! The color and smell is also really nice! Last but not least, is my ride or die, Carmex lip balm! I collect this stuff! I have drawer in my desk dedicated to at least 75 of these things! If you haven’t tried this, you really need to ASAP! It’s also super affordable and you can find it anywhere!